As I teenager living in Burbank Calif. in the early 50's I had a deep interest in photography. I had a 4X5 Speed Graphic and developed film at home in trays set in the bath tub. At school as the teachers assistant, I had access to regular tanks, an Omega D2 and full darkroom facilities. 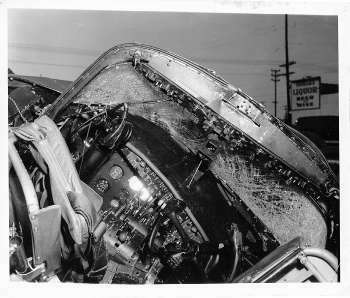 One day my older brother called me telling me a converted B-26 had crashed. I rushed to the scene and recognized the plane as having been based at Grand Central Air Terminal in Glendale since I was taking flying lessons there. The Speed Graphic gained me instant passage through the police lines. 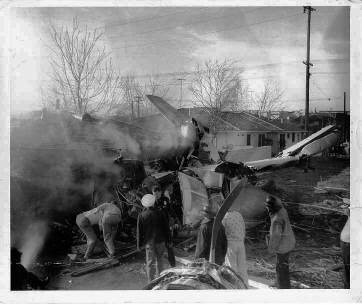 One person had been killed in the house, but both pilots lived. They had taken off and lost an engine cowling; they shut down the engine, but left gear and flaps down. The airplane was too dirty to fly and came down about 5 miles away. I rushed home and darkened the bathroom. I quickly processed the film and my Dad took me downtown to the L.A. Times. Alas they had already obtained pictures. Although they really liked my photos, they told me next time let them process the film and they would print them wet. Had I not stopped to process the film, but taken it right to the Times I might well be working as a News Photographer.